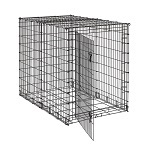 1154DP Midwest Dog Crate Divider Panel is great for dog crate training a puppy as it grows. The Dog Crate Divider Panel reduces the size of the 1154U Midwest Big Dog Crate as the puppy grows allowing you to purchase the size of dog crate needed when the dog reaches adult size. Dog Crate Divider Panel is finished Black.